IAIA Museum of Contemporary Native Arts’s (MoCNA) current local Artist-in-Residence David-Alexander Hubbard Sloan (Navajo) will give a talk on Saturday, March 4, 2017 at 12 pm, plus his studio will be open to the public through 4 pm. Every year, the MoCNA offers residencies to local artists working in any media. We are pleased to announce our current resident. 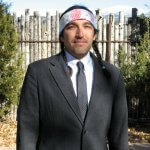 David-Alexander Hubbard Sloan (Navajo) was born and raised in Santa Fe, New Mexico. Sloan works in painting, printmaking, and jewelry. He received a Bachelor of Arts in 2-Dimensional Studio Arts with a minor in Environmental Science from the University of Arizona in 2003. He continued studying art at the Santa Fe Community College, the Institute of American Indian Arts, and Poeh Cultural Center. As his neo post-modern works facilitate his Navajo culture, he also uses his practice to express preservation and respect of nature and ecology. “I think my creative ideas look to both Navajo and Indigenous people’s relationship with the environment which is what we are really all about.” Sloan was featured in ARTiculations in Print: David Sloan T’ah aniiłtso Yéé’bii’ Neiikai (Endangered Species) at MoCNA. He currently exhibits in local New Mexico galleries, has participated in SWAIA’s Santa Fe Indian Market for over ten years, and he currently teaches silk screening. Sloan’s residency will run from November 2016 through March 2017. For more information, please contact MoCNA Membership and Programs Manager Andrea Hanley (Navajo) at (505) 428-5907 or ahanley@iaia.edu.